It works with the new iPhone 3.0 software. All you have to do is go to Google's homepage in Safari and you'll see text that reads, "New! Try My Location to find restaurants, shops and bars near you!" When you attempt to allow Google to use your location info within Safari for the first time, the iPhone will pop open the usual message about sharing your location info with Safari which you have to accept or reject. Since Safari runs in the background this could potentially open the door to some interesting location-based services (LBS), since the alternative is 3rd party iPhone location apps which must remain running in the foreground, thus limiting their usefulness. In theory, a developer could write a hosted web app that tracks your current location and shares it with your spouse or buddy list. One could hope such an app is forthcoming - or maybe not depending on your privacy perspective. It works with the new iPhone 3.0 software. 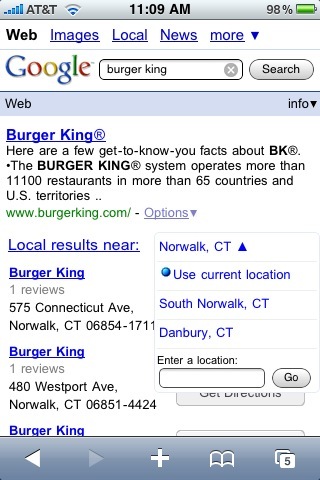 All you have to do is go to Google's homepage in Safari and you'll see text that reads, \"New! 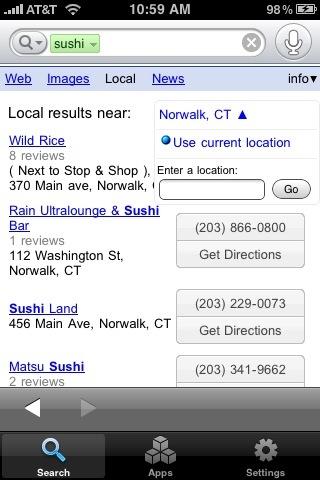 Try My Location to find restaurants, shops and bars near you!\"